Buried Fernwood Cemetery, Henderson, Kentucky. Tombstone photographed 1 January 2010. 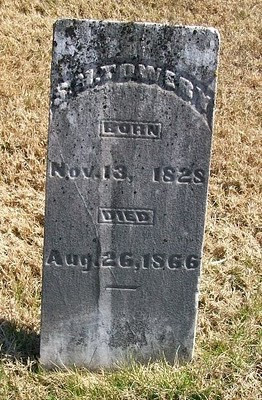 Henry Haynes' death certificate shows that he was born 8 June 1845 Breckenridge County, Kentucky and died in Henderson 28 March 1928. He was the son of Stark D. Haynes and Mary Warfield, both born in Breckenridge County. He was a retired farmer. 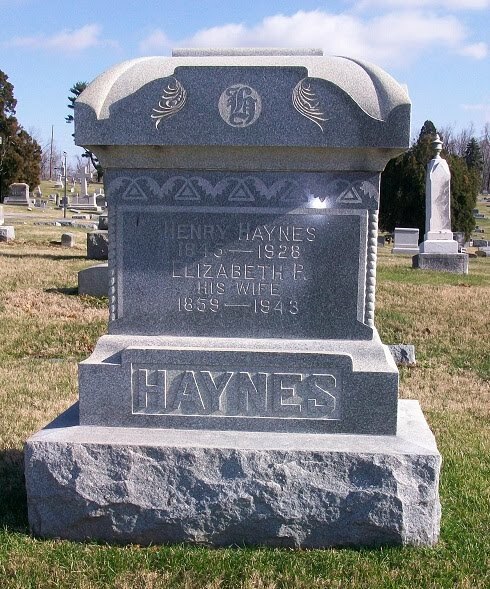 Henry Haynes' obituary appeared in the 29 March 1928 issue of the Henderson Morning Gleaner. It stated he was survived by his wife and sons, Leander and Paul, of Evansville, and Henry Haynes Jr. of Daytona, Fla. Funeral services were held at his home on North Main street. Elizabeth Priest Haynes, widow of Henry Haynes, was born 6 June 1859 Henderson County and died 31 October 1943, according to her death certificate. Her parents were Ferando Priest and Francis Butler, both born in Kentucky. Elizabeth P. Haynes died in the Henderson hospital after falling and breaking her hip in her home on North Main street. She was survived by sons Henry, Daytona, Fla.; Joe, of Evansville and Paul H. of Reed and 10 grandchildren. Also surviving were three brothers, Roger Priest, Detroit, Mich.; J.W. and Geo. F. Priest, Hebbardsville. Her obituary appeared in the 2 November 1943 issue of the Henderson Morning Gleaner. 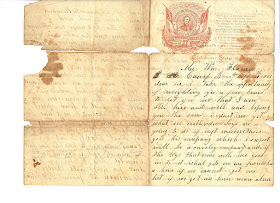 Family letter written by Thomas J. Flanary of the 3rd Kentucky during the Civil War. 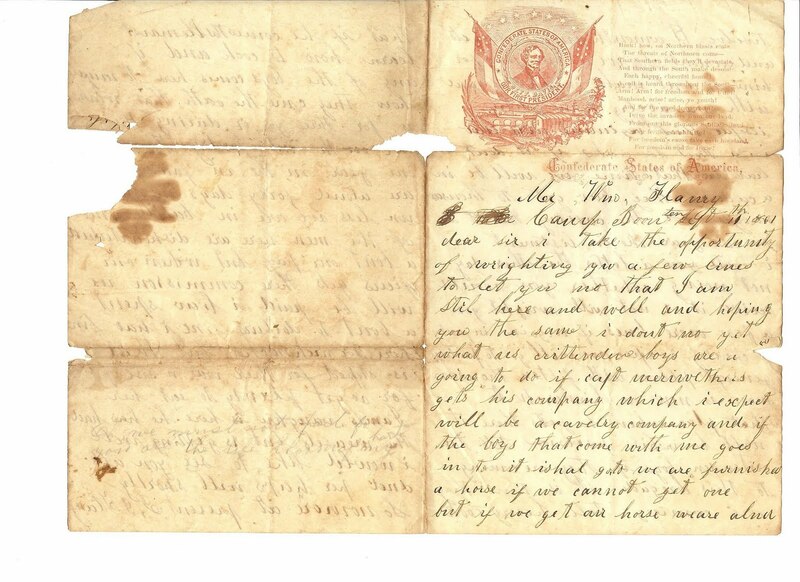 Original letter in the possession of Nancy Weldon Hodge of Marion, Ky. 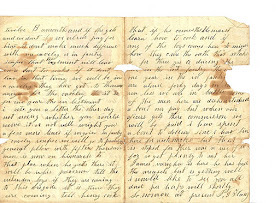 Translation and footnotes provided by Marty K. Hodge, who retains copyright of this letter. Please do not copy without consent. On this Thanksgiving morning, I am thankful for my family for their patience and understanding as I became deeply involved in this life long journey of finding my ancestors. It doesn't seem possible that my children were infants when the journey began. I have also been blessed in knowing some wonderful folks during my many years of research. As a beginner, more experienced researchers guided me and taught me the skills to achieve more positive results. They have, indeed, earned my gratitude. Most of all, I am thankful for living in a country where we are free to live where we want, worship as we desire and where our leaders are chosen by a democratic process. Please, take a few minutes today - and every day - to count your blessings and express your gratitude to those who have influenced your life. Word has been received that the 166-year-old Livingston County, Kentucky courthouse and the slightly less younger clerks' offices have been approved to be placed on the National Register of Historic Places. Administered by the National Park Service and state historic preservation offices, the National Register of Historic Places is the nation’s official list of historic and archaeological resources deemed worthy of preservation. The National Register recognizes districts, sites, buildings, structures and objects significant in American history, architecture, archaeology, engineering and culture. The old courthouse and clerk's offices were nominated to the National Register by the Livingston County Historical and Genealogical Society. Many hours of hard work by the Preservation Committee resulted in this honor. Thanks are due to all who participated in the process. The historical and genealogical society will host a Civil War Christmas Dinner on Friday, 9 December 2011 at 6 p.m. at the Senior Citizen's Center, 508 Rudd Street, Smithland, Kentucky. Tickets are $10 with meals for children under six being free. Tickets may be purchased from the Log Cabin Research Center Monday-Friday between 1 and 4 p.m.. Call 270-928-4656 for additional information. On the menu for the evening will be Knoth's BBQ with fixin's and some foot stompin' music. There will also be an auction and door prizes. Todd Hatton of WKMS radio, will be master of ceremonies. Guest speakers will be Tim Sheeks as General Grant; Billy Riley, Livingston County Attorney; Judy Wasko; Alex and Barry Whitworth and Berry Craig, well-known writer and professor at West Kentucky Community & Technical College. Civil War relics will be on display. All proceeds will go toward the preservation of historical Livingston County property. Buried Smithland Cemetery, Livingston County, Kentucky. Tombstone photographed 14 August 2009. 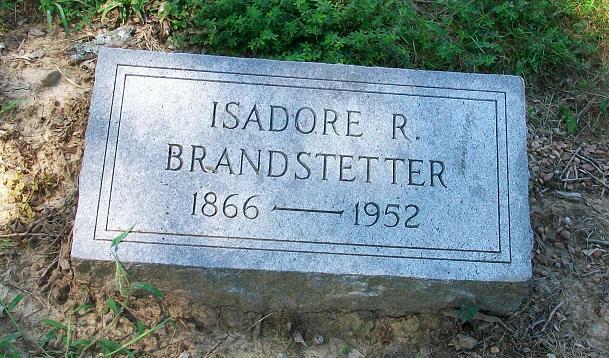 The Kentucky death certificate of Isadore Brandstetter shows he was born 18 June 1886, but died 9 October 1952 at the age of 86 years, 3 months and 21 days. The year of birth (1886) is clearly in error on his death certificate. 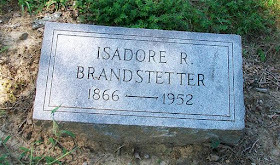 Brandstetter was a merchant in Smithland. He was born in Switzerland and his parents were Esadore Brandstetter and Julia Spinner. 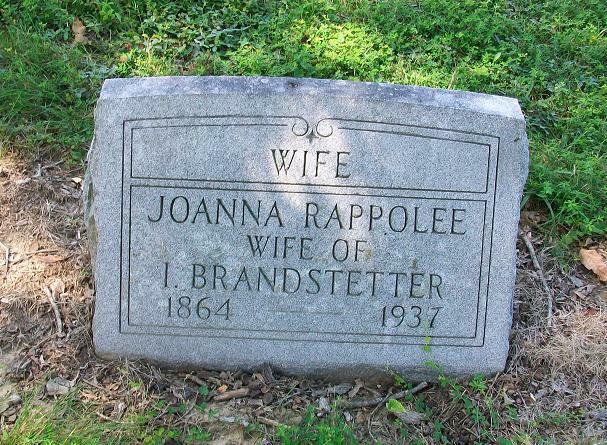 Joanna Rappolee, wife of Isadore Brandstetter, was born 29 September 1864 and died 7 May 1937. She was the daughter of F.J. Rappolee and Sarah Emeline Latimer, according to her death certificate. I have been transcribing obituaries 1942-1947 and came across a list of Livingston County men who died during World War II. The article can be found in the Livingston Leader, 1 May 1947, page 3, column 1. More than 9,000 Kentuckians died during this war with 35 men being from Livingston County. It was noted that this list may not be complete. Roy Wilford Anglin, Rudell Houston Anglin, William M. Bales Jr., George W. Ball, Roy Francis Blaine. James Homer Brasher, Billy Bennett Cook, Marvin D. Damron, Calvin Martial Davis, Sherman Henry Driver. Orbie Joy Guill, William G. Hall, Harry E. Haney, Harold Davis Hayden, Darwin Y. Howard. Thomas Vinston James, Everett O. Jones, James S. Kayse, Harold Clement Kemper, James O. Lamar. Willis Nelson Lemon, Eugene Foster McCandless, William R. Marshall, Clifton Edward Matthews, William S. Mitchell. Ralph Morris, Chester Lynn Paris, William Lander Peek, Veldon Junior Smith, William Jackson Smith. Ovid R. Stubbs, Orvill Edward Swinford, Jesse Soleman Thompson, Willis Barney Thompson, James Henry Wilkey. Pvt. Billy Cook was killed in Italy 19 February 1944. He was the son of Mr. and Mrs. Roy G. Cook of Salem. Sherman Driver, age 32, was killed in Germany 22 November 1944. He was from Birdsville. Darwin Young Howard died 31 August 1943 in the South Pacific. Bill Lemon, husband of Ruby Lemon. His death notice appeared in the newspaper 4 January 1945. Ralph Morris of Carrsville was killed in action 12 August 1944 in France. C.B. Roe, age 21, died 14 June 1944 Italy. He was born in Smithland, but had lived in Michigan about 4 years before he enlisted in 1943. Jack Smith of Grand Rivers; death notice appeared in the newspaper 30 July 1944. J.H. Wilkey, age 23, died 26 May 1944 Italy. The following newspaper article appeared under the title of Just about Crittenden Folks by Braxton McDonald in the Friday, 9 October 1936, issue of the Marion News. Ninety years ago Crittenden County was little better than a thinly settled wilderness with a population of less than 5,000 including slaves. Only three or four buildings were located where Marion now stands. This was merely a place where roads crossed leading to the more populous communities such as Salem, Dycusburg, Princeton, Weston, Fords Ferry and Morganfield. In 1846, there were only six stores in Crittenden County. These were located at Dycusburg, Tolu, Weston and Fords Ferry. There were only 49 town lots and they were located in the towns mentioned above. One tavern license was issued that year. In that year there were 696 slaves in the county with a total valuation of over $200,000. Items of taxation were few in 1846. Taxes on all carriages in the county were only $2.00; on all gold watches, $7.00; on gold spectacles, $2.00. In 1846, the Crittenden County jailer received 82 cents for committing and releasing criminals, and the cost of feeding criminals for the year was only $1.87. Crittenden, a county in the W. part of Kentucky, bordering on the Ohio river, which separates it from Illinois, has an area estimated at 420 square miles. Tradewater creek forms its boundary on the N.E. and Cumberland river on the S.W. The surface is mostly level or gently undulating, but the E. part is more hilly; the soil is fertile; tobacco, Indian corn, oats and grass are the staples. Pork and stone coal are also exported. In 1850 this county produced 386,705 bushels of corn; 5759 of wheat; 45,460 of oats; 505,637 pounds of tobacco, and 12,545 of wool. It contained 14 churches, and 600 pupils attending public schools. Stone coal is abundant in the county, and the mines of lead and iron are said to be inexhaustible. Formed in 1842, and named in honor of John J. Crittenden, for many years senator from Kentucky, and twice attorney-general of the United States. Capital - Marion. Population 6351, of whom 5503 are free and 848 are slaves. Marion, a post-village, capital of Crittenden Co., Kentucky, about 230 miles W.S.W. from Frankfort. It contains a court house and over 100 inhabitants. Buried Duncan Cemetery, Crittenden County, Kentucky. Tombstone photographed 20 September 2011. 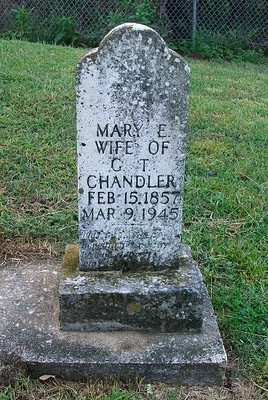 Mary E. Duncan married George Chandler 28 November 1876 Crittenden County. They appeared together on the 1900 Crittenden County census in Bells Mines Precinct. On the 1910 census, Mary E. was living in the household of her oldest son, William T. Chandler. According to her death certificate, Mary Elizabeth was the daughter of Jesse Duncan and Acina Love, both born in Tennessee. 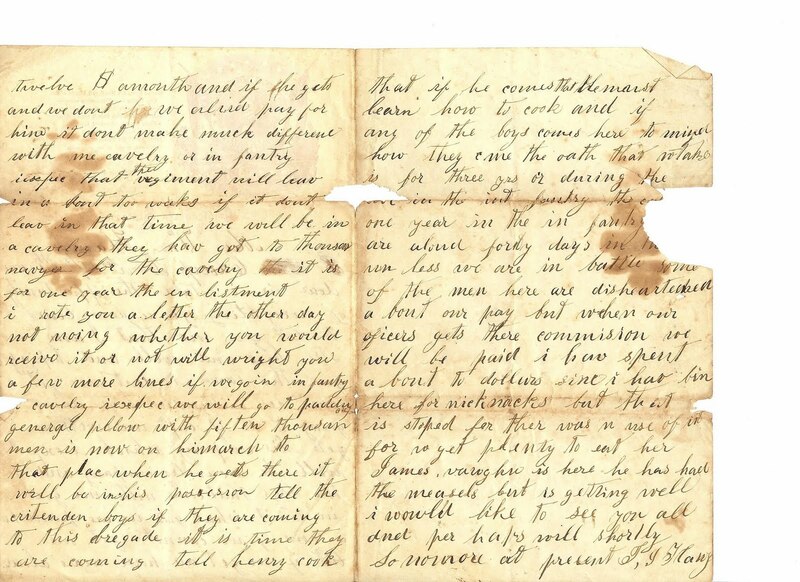 Proving that little jewels can be found in the most unusual places, the following entry was discovered in Caldwell County Court Order Book H, page 166, 18 December 1852. "F.H. Hynes came into court and made oath that Sarah Bledsoe, widow of Wm. M. Bledsoe, a pensioner of the United States died in this county of Caldwell and state of Kentucky at the house of Samuel Hynes and that she left Emily J. Bledsoe her only surviving heir, who is now living in the County of Caldwell, a minor, all of which is ordered to be copied and certified to the proper Dept. in Washington City, that she may draw the pension and extra pay, to which her parents were entitled." Benjamin H. Coone was appointed guardian of Emily J. Bledsoe, infant orphan under the age of 14 years of William M. Bledsoe, 15 November 1852. [Caldwell County Court Order Book H, page 163] A little research should determine the service on which the Bledsoes were entitled to a pension. If you have researched very long, you know the frustration of locating a piece of promising information only to learn no source is given. Or maybe a source is cited, but when you track it down, you find it says something entirely different. So, how can we stop this reckless practice of slipshod genealogy? As one who has been researching many years - ok, I confess; I'm old - I have definite ideas on being a responsible researcher. As a responsible researcher, I stand behind all the work I do, but I do not take credit for the work done by anyone else. If I work on a group project, the work is not mine alone. It is a joint effort and all participants are recognized. Being a responsible researcher also means that I cite my sources correctly and completely. This allows other researcher to easily locate that source. If Aunt Betty tells me her parents married in 1902, the source of that information is Aunt Betty. However, if I obtain a copy of the marriage record, I can use that marriage record as the source of my information. Because I am a responsible researcher, I will never knowingly pass along erroneous information. If there is doubt in the validity of the information, I will indicate that is the case. If another researcher provides me with proof that I have incorrect information or have reached an incorrect conclusion, I will not be too proud to accept the fact that I was wrong or to correct my records. As a responsible researcher, I will treat all courthouse records with respect. I will not mark or maim any records. If portable scanners and cameras are not allowed to be used to copy records, I will abide by this rule. As more experienced researchers once helped me, I will patiently answer questions from novice researchers and will not take over their research. Allowing them to learn how to research will provide them with the same pleasure in accomplishment that I have enjoyed. A common complaint among us "old timers" is that novice genealogists are content to search online only and have no idea what can be found in courthouses. 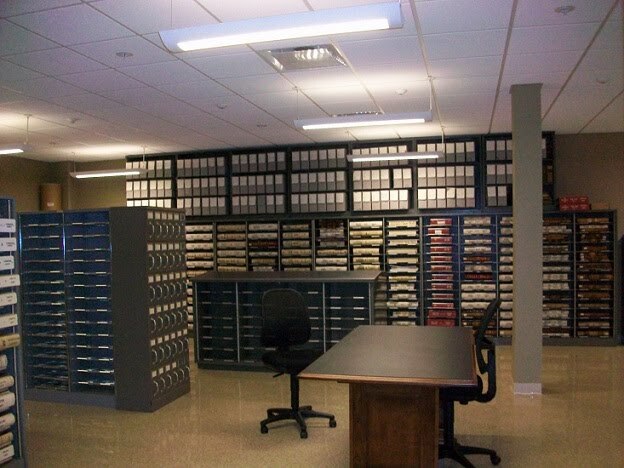 I believe it is our duty to promote good research practices and to share our knowledge on locating, using and recording genealogical information. If we fail in this, we are letting down our successors and are not giving genealogy the respect it deserves. Buried at Sugar Grove Cemetery, Crittenden County, Kentucky. Tombstone photographed 11 March 2011. 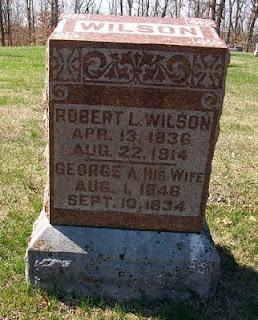 Robert L. Wilson was the son of Francis T. and Elizabeth Wilson, who came from Tennessee and settled in Crittenden County. Robert L. Wilson and George Ann Travis married 11 January 1866 in Crittenden County. Last week I visited the County Clerk's Office in the brand new Livingston County Office Building in Smithland, Kentucky. I had been concerned about parking near the entrance, but there was no problem and parked right in front of the building. There is no way to compare this new building to the old courthouse. The County Office Building is spacious, airy and convenient. 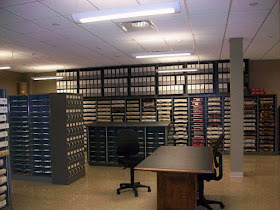 The room (see above photo) containing the deeds, marriages, wills and other public records has several desks for the use and convenience of visitors. No more standing for hours while transcribing records! While the new building has many conveniences, it does not have the character of the old courthouse. Every time I entered the courthouse, I felt history all around me. I just hope that both buildings can survive, side by side, for many years to come. Vandals hit the historic Cedar Hill Cemetery in Princeton, Caldwell County, Kentucky last weekend, damaging a number of old tombstones. The damages have been estimated at over $100,000. Richard P'Pool, a local historian, is attempting to repair these broken tombstones the same way he did when vandals struck the cemetery in 2005. Among the damaged tombstones is the one for Evelyn Groom shown below as it looked in March 2011. Following the work of the vandals, the tombstone was broken into several pieces and lying face down on the ground. Information on this vandalism should be reported to the Princeton Police Department. The following report comes from Annual Report - Kentucky State Board of Health 1906-1907. The population of Union County, Ky. is 27,000, not many of them have been vaccinated of late. We have an eruptive hospital located 3 miles from Morganfield, Ky., with a capacity of 50 patients, but we have not used it since our last report, but quarantine smallpox, scarlet fever, and diphtheria where found. There have been 8 cases of scarlet fever, colored patients; 55 cases of measles, colored patients; 10 cases of typhoid fever, colored patients; diphtheria, colored patients, none; 30 cases of tuberculosis, colored and 20 deaths, about 7 of these cases were consumption of the bowels. Two cases of tuberculosis, (whites) 2 deaths. Ten cases of typhoid fever, 2 deaths. Two cases of diphtheria, (whites), no deaths. Fourteen cases of scarlet fever, (whites), no deaths. Measles prevailed endemically at Morganfield District, 200 cases or more, no deaths. Chickenpox prevailed at Hitesville, no deaths. The Board of Health has done good work. No school discontinued on account of diseases; no deaths of school children from any contagious or infective diseases. The Board of Health have required deep, dry wells, 60 or 70 feet deep where nuisances have been created by emptying slops from kitchens, bath houses and where the same have been connected with privies and emptied into the streets in towns. There are nine slaughter houses in the county, all in good condition, nine meat markets, all screened in, and meats kept in tight vaults, with large ice boxes in each one where the meats are hung. Everything is prosperous in Union County, Ky., and the "Goose hangs high." Thos. J. Shoemaker, M.D., Secretary. Buried Shady Grove Cemetery, Crittenden County, Kentucky. Tombstone photographed 11 March 2011. Shelton M. Towery is found on the 1860 Crittenden County census with his wife, Nancy A.E. (Joyce) and children John W. and Nora. Nancy A.E. Joyce was the daughter of James P. and Lucinda (Hopkins) Joyce and is enumerated with them on the 1850 Crittenden County census.